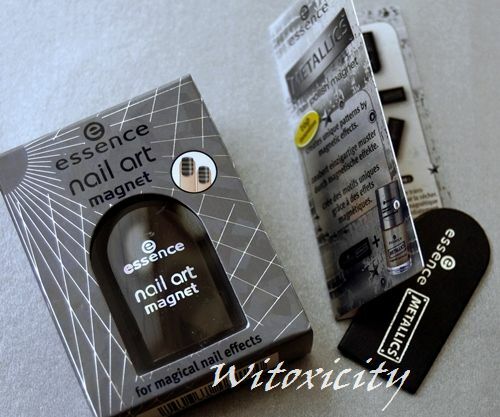 It's time I featured a magnetic polish from Essence, one from umm, Version 2.0. I tried Version 1.0 back in 2010 and it was a big fail. I was sorely disappointed by the un-magnificent magnetic performance: no pattern, nada! I was so disappointed that I chucked them all into my drawer and refused to even write a post about them. It just wasn't worth my time. Other ladies had mixed results. The general consensus back then was that the magnet wasn't strong enough and some ladies had better results with fridge or other stronger magnets. 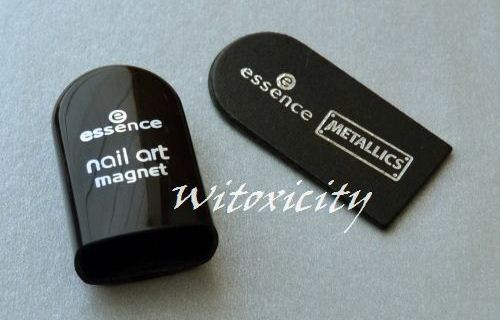 Anyway, Essence brought out a new line of Essence Nail Art Magnetics nail polishes together with a redesigned magnet last year, calling it the Essence Nail Art Magnet. I wasn't as enthusiastic as before but I did buy a couple of the new items. 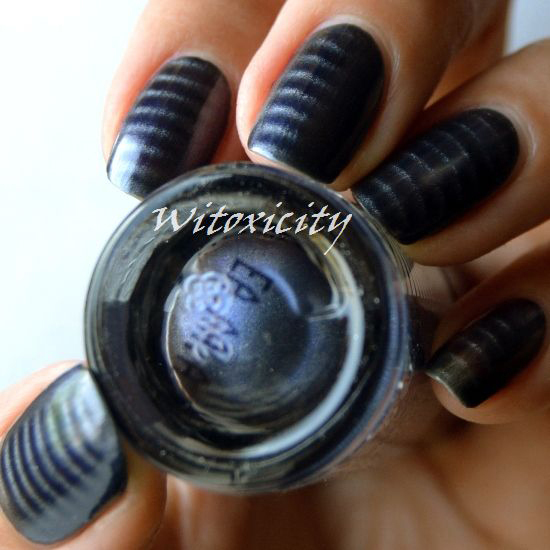 A few months ago, Essence released a few more new magnetic nail polish shades which I thought were really cool colours. Essence Spell Bound is one of the fairly new magnetic shades. It is a broody dark blue with subtle bits of silver and cobalt blue shimmer (obvious only in sunshine). This time, I was very pleased with the magnetic effect. The new magnet actually works! I know most of you are already familiar with magnetic polishes but for the benefit of those who are new to this, I've included here a short how-to. And, as with most things in life, it requires patience, determination and lots of practice. It's very satisfying when you get it right. Each magnet will produce a pre-determined design. 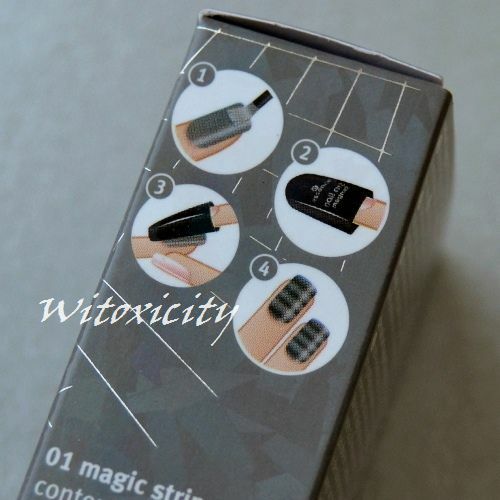 Basically, over your usual base coat, you apply one not-too-thick, not-too-thin coat of the magnetic polish on one nail and quickly hold the magnet facing your nail for at least ten seconds (some recommend 20-30 seconds). Repeat the process nail by nail. 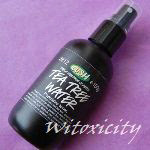 • Do it quick when the polish is still wet. • Hold the magnet as close to the nail as possible without touching it. • As far as the Essence magnet is concerned, by "close", I mean a distance of about 2-3mm. Yes, it can be tricky. • To keep steady, have your hands/arms anchored on the table. 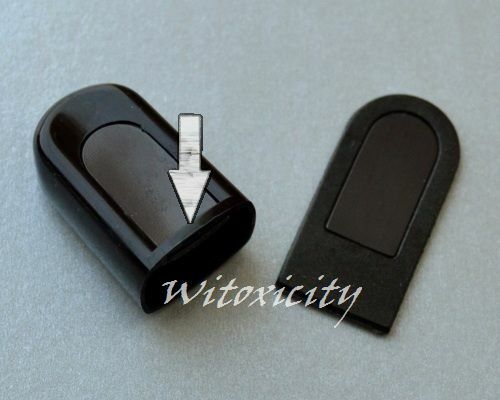 • You can see better by viewing your nail and the magnet from the sides. • If needed, shut one eye for the side view. It works for me, however unelegant I end up looking. Although you're supposed to slip one finger into this Essence magnet piece, I prefer to simply hold the magnet with my thumb and forefinger as I can hold it steadier that way. With this particular Essence magnet, I like to rest the polished finger, i.e. the knuckle closest to the nail, against the protruding plastic edge (indicated below by the arrow) of the magnet piece. I find it the best way to keep steady and be able to hold the magnet as close to the nail as possible. One nail - the ring finger here - did touch the magnet. Luckily, it was just a fleeting, light touch that didn't cause much damage. You can see a blurry vertical 'band' running across a few of the stripes in the first nail photo above but it's quite subtle from other angles. The magnet that I've used here is 01 Magic Stripes. If nothing's defective, you'll end up with the results as promised on the packaging. Hold the magnet diagonally and you could get diagonal stripes. I've had mixed results with this though, probably because I couldn't hold the magnet close enough to the nail at an angle (the angle of the stripes follows the angle of the magnet held in relation to the nail). Essence has another magnet out called 02 Magic Star which is supposed to produce a pretty star pattern. I won't comment on it as I haven't got it myself but I can say that I've heard some less-than-positive things about this other magnet. I'm sure it hasn't escaped your notice that many brands have brought out magnetic polishes in the past year, so shop around. Essence just happens to be the brand that I have easiest access to. Wow this turned out FANTASTIC! I didn't know that essence magnet was removable from that unuseful plastic piece, and so I even never tried to do...Thanks for the great info! Hi, Chiro! It's lovely to hear from you. :) I think you have misunderstood me. I haven't attempted to remove the magnet from the plastic holder, nor did I allude to it. I'm sorry if you thought I did. The magnet on the right is the old (useless) version, just for comparison. So, I certainly hope you haven't tried it at home! I'd hate it if you ended up with a disassembled magnet piece! What a great nail effect. Well done!